I have finally gotten the parts to do some major revamp on my computer rig. It has been a long time coming and 2014 marks the year for a semi-major upgrade for my rig. For those familiar with the custom PC building scene, a PC usually doesn’t remain the same throughout the years as compared to say a game console (PS4, Xbox One etc). A PC can constantly be upgraded and modified to keep up to date to the latest tech and performance. I have been doing some upgrades here and there during the past few years, mainly changing my graphics card. I’m glad that the second-hand tech market in Singapore is rather busy, allowing one to buy and sell parts pretty easily. That’s how I get the money to do the upgrades. Sell the old, buy the “new”. Before purchasing the brand new motherboard and CPU, I’ve been monitoring the second-hand market to see if anyone had anything for sale. 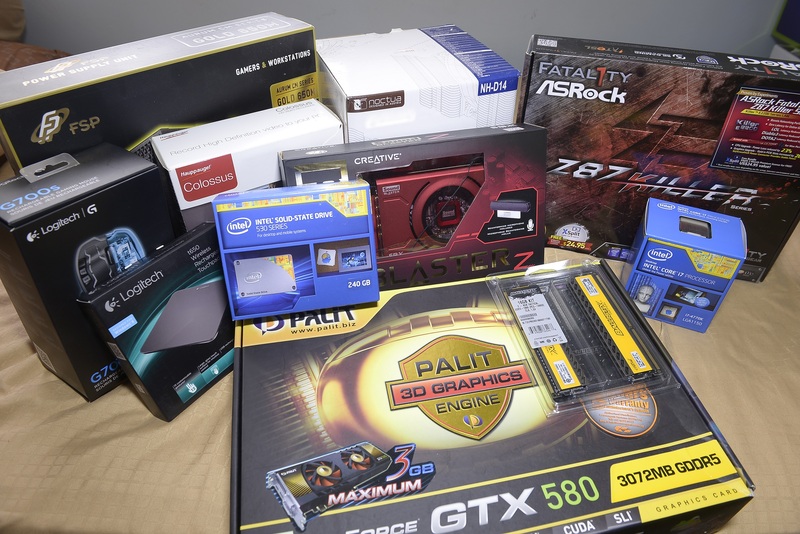 Many people were selling their LGA 1156 and 1155 CPUs and motherboards. I didn’t want a previous generation chip and thus decided that the only way to go was to buy it brand new. Besides, people weren’t selling their stuff much cheaper anyways. Good deals come by occasionally but I wasn’t lucky enough to find one. My previous processor and motherboard was the i7 920 and Gigabyte EX58-UD3R respectively. Technically, I do not need to change anything since performance should be sufficient enough for gaming and mainstream activities. I found that you can sell cpus processors and was able to make a some money off my old processor. The main reason why I had to change was the lack of support for SATA3 connections. This meant that should I put in a SSD (which I intended to), it will be bottlenecked by the SATA2 port available on my motherboard. Changing the motherboard sounds feasible but really isn’t as there aren’t many people selling their LGA1366 motherboards. Even if there were, it simply made no sense to pay that money for such old technology. I thus decided to buy a brand new CPU and motherboard. I kept the graphics card as it is as I simply find no need in upgrading it. I mean most games now a days don’t require that much a powerful graphics card. I don’t really mind toning down the graphics options a little anyways. Besides, getting a second-hand graphics card is pretty easy and there are times when people sell them at a very value for money price. For example, the GTX 580 that I’ve bought costs me only $200 SGD and that was about 1.5 years ago. That’s roughly the performance of a GTX 660 TI but at half the price (comparing the prices then). At the moment, I’m still scouting out the graphics card section in the marketplace of my local forums for any good deals to come by. If there is one, the GPU upgrade will happen. I chose the i7 4770K mainly because I felt that the CPU is something that I don’t usually change. My previous i7 920 lasted me close to 5 years and this one will as well. Besides, there aren’t any upcoming consumer related technology that is about to be introduced (DDR4 is the one that is coming real soon but doubt it’ll really be for normal consumers like myself). It is thus somewhat “future-proofing” in a sense (something I never believe in technology, there is no such thing as future-proofing. Oh the irony!) as most tasks I do will not need anything more powerful then what I have. It is the same plan as per before, have a great CPU and upgrade the GPU in the future should there be a need. To further justify my purchase, I told myself that I’m (or will be) doing video encoding and programming and those will utilize the hyper-threading functionality of an i7 processor. I lied but yes it makes me feel better. For more explanations do watch the video. I decided to write down just some of the more important thoughts about my upgrade. Ultimately, I’m really excited to finally be able to integrate a SSD in my system. It has been a long time coming. I will write again on my thoughts of windows 8.1 (wish me luck people!) once I’ve tested it out long enough. Otherwise, if you have any questions do leave a comment! I will be happy to answer them. If you’re holding off on getting windows 8.1 due to needing to remove a virus on your computer but being on a budget, visit Virus Removal Australia. Virus Removal Australia Claims to be able to fix any virus at a capped amount so you won’t have any surprises when you go to pay.